These vegan stuffed shells make me feel like a housewife who is about to win some coveted domestic mid-century award. Every time I make a meal that remotely resembles a casserole, I’m instantly transported to the 1950s. Traditionally, the term ‘housewife’ feels loaded, but when I pretend to occupy that role with all of my other identities in tow ( queer, vegan, tattooed, and cancer survivor) it feels like a badass guilty pleasure…until I have to go to work the next morning. But let’s live in the moment, shall we? When you eat a plant-based diet, the rotation of salads and various bowls (grain + veggie + protein + sauce) can get old, so mixing it up with some different ingredients is fun. 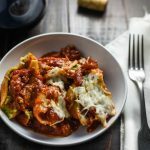 This recipe has a tangy tomato sauce, creamy tofu spinach pesto filling for the shells, and comes together with some vegan cheese melted over the top. It is also filling and holds well in the refrigerator for leftovers, so if you fill up quickly, you don’t need to stuff yourself to make it count. 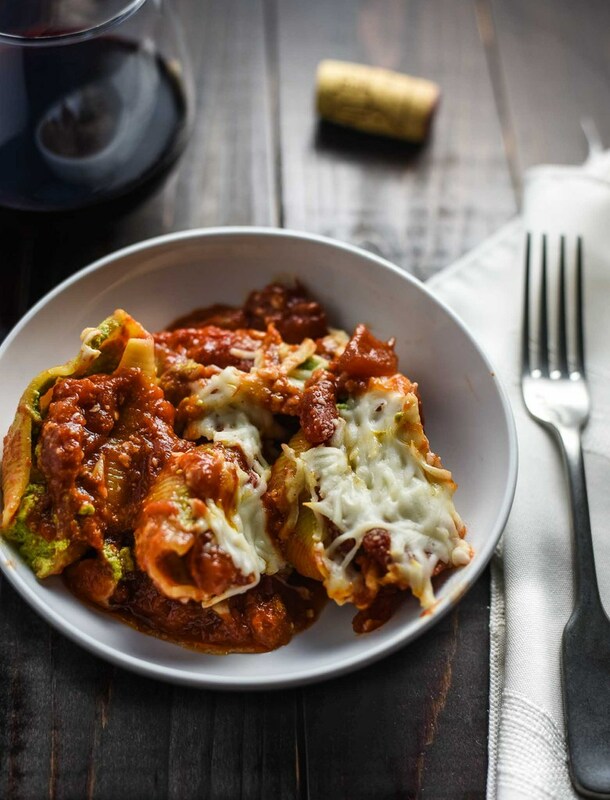 If you make these vegan stuffed shells, leave a comment, rate the recipe, and and tag a photo with #plantandvine and @plantandvine on Instagram. Let me know if they make you feel like a housewife, househusband, housespouse! Sangiovese: I’m a sucker for Sangiovese and can still remember the first glass of I tasted. Make it memorable with a high-acid red wine from Italy with rustic tomato, leather, clay, and raspberry. Yum. Barbera: Another high-acid Italian red with flavors of blackberry, mulberry, dried herb, and tar. Lower tannins than Sangiovese so less drying to the mouth. Cabernet Franc: Roasted pepper, strawberry, leather with a medium body and high acid. Cabernet Franc is the parent grape of Cabernet Sauvignon and Merlot so that’s your taste profile. Easy vegan stuffed shells with tofu, pesto, spinach, and a tangy tomato sauce. To make tomato sauce, heat olive oil in a skillet over medium heat. Stir in the garlic and cook, stirring frequently, until garlic begins to brown, about 5 minutes. Add the chopped tomatoes, tomato sauce, bruschetta, smoked paprika, and salt. Cook, stirring occasionally, for 5 minutes. Stir in the red wine and sugar. Simmer uncovered for 30 minutes. 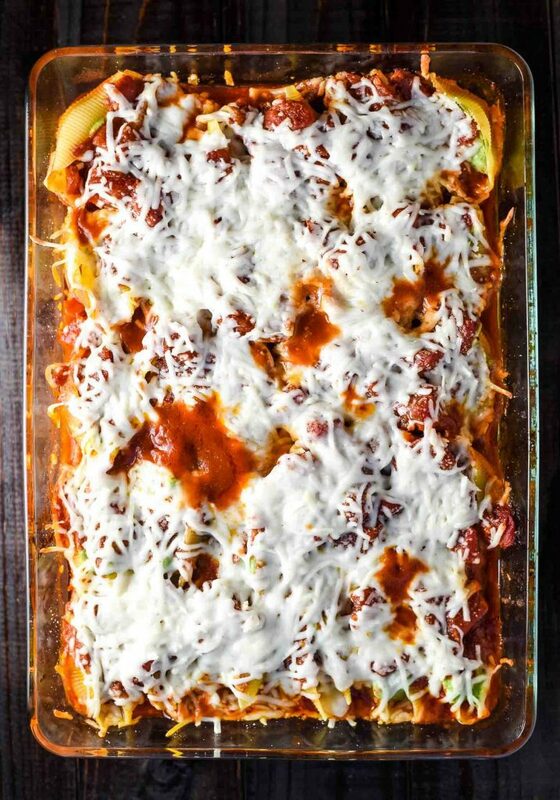 Preheat oven to 400 degrees F. Spray a 9×13-inch baking pan with cooking spray, then spread layer of the prepared tomato sauce on the bottom of the pan. 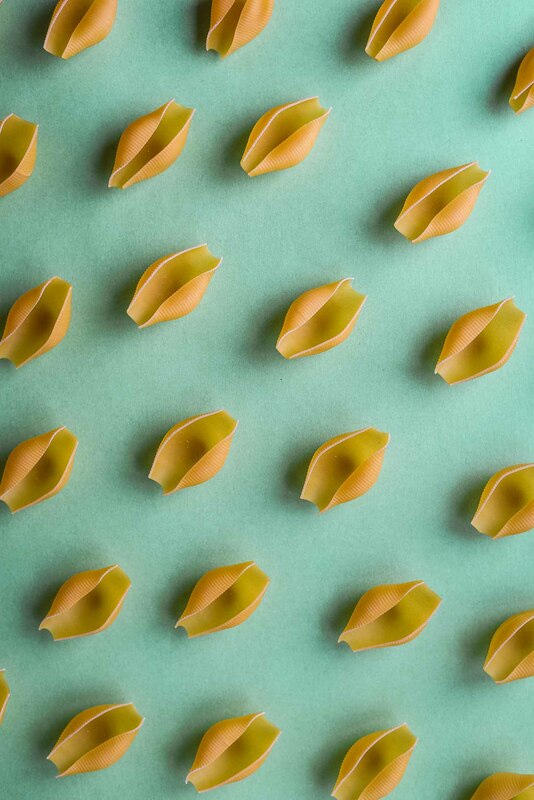 Arrange the pasta shells in a single layer on top of the tomato sauce. Place the tofu, onion, spinach, and pesto into a blender. Cover and puree until smooth. Pour the tofu mixture into a resealable plastic bag. Snip the corner off the bottom of the bag and pipe the mixture into the pasta shells, filling the pasta shells completely. Pour the remaining tomato sauce over the shells and try to make sure all exposed pasta shell edges are covered so they stay moist during cooking. Cover the pan with aluminum foil. Bake in the preheated oven until the pasta shells are tender, about 20 minutes. 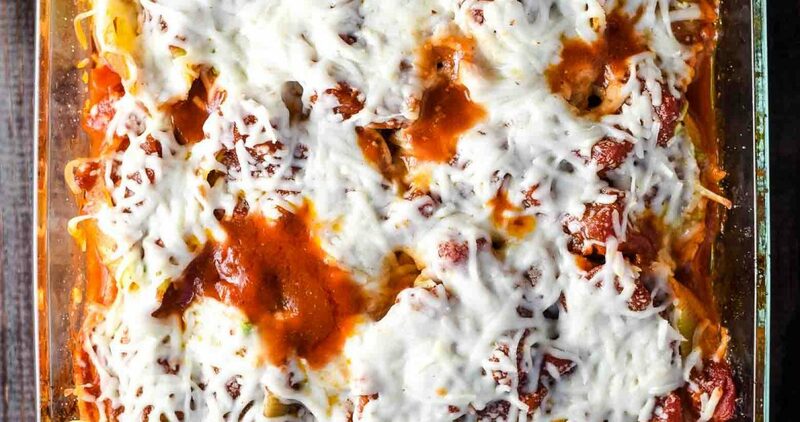 Remove the foil, and sprinkle the cheese on top. Return to the oven and continue baking until the the cheese has melted, about 10-15 minutes. Serve after cooling for 5 minutes. Store covered in refrigerator for up to 4 days.